Welcome to Day 4 of the blog tour for the best new book to hit our crafty book shelves. Sujata is one of my very favourite quilters so when a bird told me she was writing a book to say I was excited was an understatement. The book certainly lives up to my expectations and more! Let's start with a quick summary of the plot – Sujata has been making quilts for a long time starting with traditional quilts but along the way she has drawn on influences from her colourful childhood in India, a degree in Graphic Arts, American Gees Bend style quilts, and African textiles and weaving. She has gathered these ideas and developed her own free, joyful style. Now, in Cultural Fusion Quilts, she is sharing her free form, curvy, colourful techniques with us. 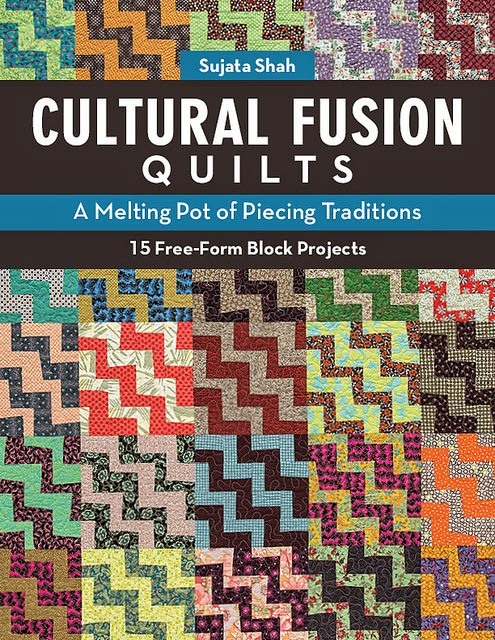 When I was writing notes about this book I found I soon had a long list of reasons why I think Cultural Fusion Quilts is a 'must have book'. You'd be here reading all day so I decided to narrow it down to 6 reasons beginning with the letters of Sujata's name. 1. Special memories. Sujata begins each project by introducing the inspiration for the quilt. These include memories of times in India, her family, special moments in a day and so on. I'm usually the kind of person that flicks through books to look at the pictures, but Sujata's observations had me captivated and I found myself flipping the pages to read her next description. It gives the book a personal touch, as though we're being told stories over a cup of tea. 2. Understand, that is, Easy to Understand. Sujata's experience as a quilt teacher shines through in the book.The projects and patterns are simply laid out, with clear step by step instructions and accompanied by coloured diagrams. 3. Jump to it !! That's what these free form quilts and projects make you want to do.Truly, As soon as I'd looked through the book I went to my sewing room and started cutting fabric for one of the quilts. As I've been sewing the Rocky Road to Kansas blocks I'm already thinking about the Endless Mountains quilts or the beautiful Winter quilt. It could be tempting to make one of each quilt, but it wouldn't stop there because for each project there are further Possibilities included, which brings me to the next point. 4. Abundance of ideas, There are 15 wonderful inspiring projects that each include a pattern for a quilt. In addition to each project there are pictures of other ways of using the blocks, inspiration photos, and sometimes more than one quilt using the same block. With all the different possibilities and inspiration photos there seems to be a lot more than the 15 projects provided. 5.Time efficient – The projects include instructions for stacking fabrics for quick cutting. Easy breezy!! This isn't something I have done much in the past. Not only was my cutting time minimised but I spent less time dithering over which fabrics to use in individual blocks, as long as I had a good contrast with fabrics the combinations worked perfectly. 6. Accessable - The book has something for everyone, for beginners and experienced quilters alike. For beginners, the clear instructions will have you sewing up blocks in no time. For more experienced quilters the book has great tips and tricks. For everybody there's inspiration galore with awesome fabric and colour play. 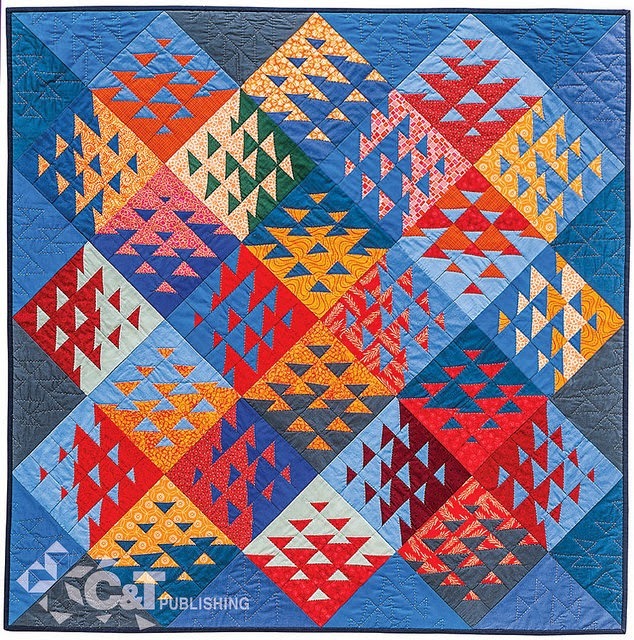 I love that because the blocks are free form, those wonderful irregular shapes are desired and not frowned upon by quilt police. This Giveaway is now closed - Thank you to everyone for your wonderful comments. I can highly recommend buying this book if you aren't one of the winners, and follow along with the rest of the blog hop or visit the past blogs to read their reviews. The lucky winners are Jeanne, and Iris G, both of whom have been contacted by email. Okay , Enough of me raving – It's time for a giveaway. C&T Publishing are giving away a copy of Cultural Fusion Quilts to US residents and Blue Mountain Daisy, that's me, is giving away a copy to an “International”. For a chance to win simply leave a comment about what You think sounds good about the book. And let me know if you're a US resident or International. There are plenty of chances to win a copy of Cultural Fusion Quilts by following the Blog Tour. You can also have a chance to win a quilt made by Sujata by visiting her blog The Root Connection. It's a great line up of wonderful blogs to visit each day so join in the fun and follow along. Friday December 5 Rachaeldaisy @ Blue Mountain Daisy - You're Here!! I'd be interested to read her special memories of each quilt. Thanks for the chance! Oh, I like the idea of easy, quick cutting - I want to get to the "making" part fast! And the abundance of ideas is really the best part. I love when a book gives you more than just the pattern. Thanks for the chance to win, Rachael! I am loving the freedom of the blocks, there is no perfectionism there but there is soul and colour. The more I explore quilting the more I am drawn to the quilts with wonky style. This could just be the guide I am seeking. Cheers from Melbourne Victoria! I have a confession...I do not like to cut fabric and I'm really not that good at it! So if there is a quick easy way I'm going to try it. I'm a U.S. reader! All the brightly colored quilt photos are reason enough to need this book! I'm International. I am so keen to get my hands on this book, looks very inspirational. I am international thanks. Your blog is in my favourites - I always love your quilts and your flowers - now a great book: I would love to add it to my stash. Keep blogging ! Thanks Iris G.
Accessable is one of the reasons I like this book. Fabric & colorplay are what feeds my quilting inspiration . I'm US. I love all the pictures from this book that I've seen so far! I'd love to start by making the cover quilt! Don't include me of course. I just wanted to say you wrote a great review and there are quite a few quilts in the book I'm looking forward to trying. Book looks a winner and I would love to win one in your Giveaway! Having grown up with cultural fusion in my own life-I would love creating with Sujata's vision and gift of combining bright colorful fabrics and patterns. what a great post for Sujata! Love the graphic nature of her quilts. Her fabric choices suits her designs too. A lot to be learned from her. Free form and curvy sewing sound like FUN ! I'm a Texan ! Easier cutting! That sounds good to me. I like the variety of projects! I am a US reader. Looks to me like this book is a boatload of inspiration! Great review, Daisy! I am like you, I love this book and think it is a must-have. My favorite? Tough one - but I think that there are so many - endless - possibilities with her techniques and patterns is a big draw for me. And her root connection stories, they draw me in. I love the fact that the book is accessible but more than that I find Sujata's use of colour so inspirational. Her quilt is so well named because both cultural influences can be seen in her quilts and they are fused together in the most delightful way. I am a Canadian follower of your blog (which I enjoy very much)! Thanks for the chance to win! I love all the quilts I've seen from the book. Beautiful - my kind of quilts. Thanks for the chance to win! Love these quilts and would love to win the book. Thank you for the opportunity. Abundance of projects. Love books that inspire many projects. US resident. "Time efficient" catches my interest! I have so many ideas and inspirations for quilt projects, would love to get more of them to the finish line :) And of course the use of COLOR in the book -- hoping for a chance to browse through it soon! I would be interested in the techniques she uses as I already improv piece the majority of my quilts now. All the possibilities to play with color appeal to me. Looks like a fun book! Well, I think the time efficient part of cutting sounds good! I sometimes agonize and get plain bored over the whole process of cutting. That and the bright colors she uses are appealing to me! I love the free form" aspect of traditional quilts. Seems like a contradiction of terms and then she dose it so well! This looks like a really fun, inspirational book! The colorful eye candy! I need to see more of these quilts! In one word... inspiration.... and an abundance of color! What a wonderful review you have written Rachael and thank you for introducing Sunjata to me. Apart from the wonderful colour and freeform style she uses the reading of the root connection in the book is what I am looking forward to. Kia Ora from New Zealand. Cute the way you incorporated her name in your review. The idea of Jumping in to start a fun quilt is really appealing! Thanks for putting my name in the hat. I love the idea of slightly quirky piecing. I tend to get hung up on accuracy and making things match, and this more relaxed approach sounds like a lot of fun. I've read lot about this book and it seems like a real winner! Thanks for the chance to win a copy! I'm right here in Oz, but you know that! Several things sound good about her book. The memories, the ease of making and the abundance of ideas. I love all the different quilts in the book and can imagine making several of them. Tips to cut easily are always welcome. Great giveaway Rachael - thanks for the chance. I'm one of your Aussie followers and this sounds just your sort of book doesn't it?! 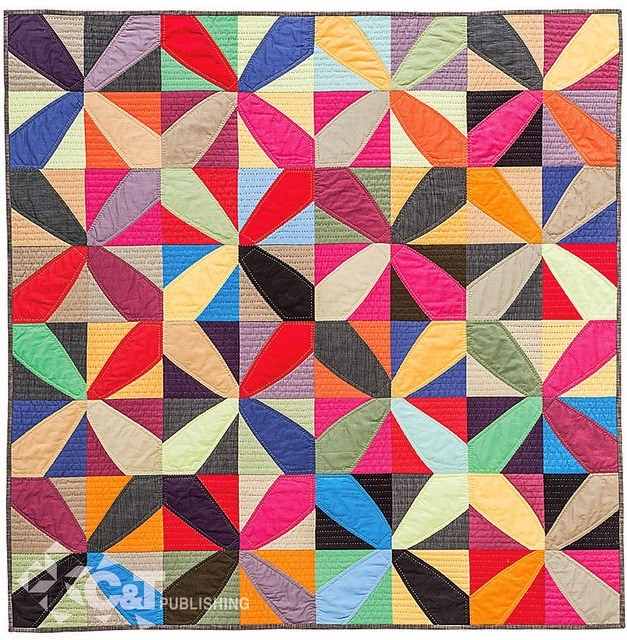 I love the movement in the quilts but also the use of stunning scrappy solids. I love all of the ideals in this book and I am fairly new and I need all I can get! Thanks so much for the giveaway! oops forgot to say I'm international ! hehehe sounds way more chic than Tumbarumba ! I need tips on cutting fabric. I am really inefficient! Wow, I took a look around your blog and you've become one of those precious blogs that I actually follow. Great posts everywhere! I'd love to win a copy of this e book as well? so lets put our respective universe good ideas together and win it for both of us! I've been avidly following this blog hop because this book looks riveting. The colour in these quilts is so beautiful. I'm drawn to the inspiration stories. Oops, forgot to say I'm in Australia. Looks like a fantastic book Rachael! Good Luck everyone bad thank you Rachael! Definitely the colour combinations, they make my heart sing. I am an international follower. I love stacking fabrics and cutting them. I am always looking for patterns like that. I really love all the colors in her quilts. Just looking at the pictures makes me want to drop everything and go sew! Her blog has that same effect on me. I like that the book is written also for beginners. This book sounds like something I would love to work from - especially the other different ideas for particular blocks - just what is needed to get the creativity flowing! Thanks for the opportunity to win - I'm in Australia too, so I must be international! I feel that this book will be just up my alley - the different uses for each block will encourage creativity and I'm in Australia too so I must be International!! Love the pictures! They are inspiring! There are some great colour combinations in the quilts in the book. Also a greet balance of hue tints and shades. Just beautiful well done. Clever way to summarize the book. I might use it to get local quilt board to agree to have her come lecture. I love the quilt on the cover! Please add me to the drawing! Looks like a very unique and inspirational book! I love the international flavor of the designs and color. I like the idea of a more free-form approach....perfect points, etc.. are not what this book is about and that is refreshing. I think Sujata's techniques sound very interesting, traditional blocks made individual by freestyle cutting and piecing. Thanks so much for the chance to win a copy of Sujata's book. I like thinking outside the box more and more as I quilt and the quilts in this book are giving me lots of ideas! I'm from the US. I've been reading Sujata's blog for ages and I love her quilts, I'd really love to win her book. Thankyou for the opportunity. I live in Australia. I love Sujata's fabric selections. We certainly are lucky that she took up quiltmaking and then was encouraged to write a book. This is now on my Christmas wish list! The Special memories of India drew me in straight away (as I spent my childhood there! ), and her use of colour is wonderful. I am always interested in books that give possibilities. This looks wonderful. I love her use of unique fabrics, this looks so inspiring! You wonn me over, easily!! It sounds and looks like a wonderful book. Thanks for the chance to win a copy. I live in the Netherlands (Europe). Nice blog too, so much inspiration. I think this book would give me lots of great ideas for using up some of my many scraps. Thanks for the chance to win, I am in the US. Oops! I'm in the USA. I have loved Sujata's quilts for a long time and will appreciate learning more about her fabulous Colour choices. Thank you for giving us international readers a chance to win this book. What sounds really great about this book: free-form piecing! It would be so refreshing to put away the ruler when I cut fabric for quilts. I've enjoyed the blog tour immensely. And I hope to enjoy the book soon. This book looks super interesting. Lots of great ideas here. I'm in the US. I loved the last quilt pictured, like moving water. I have a mental 'problem' with free form. Just cannot seem to do it but like the idea of stories to go with each quilt. That always makes things more interesting. Thanks for showing the book. I would love to learn more of her life and how she came to be quilting as she does. Oh my - this book looks fabulous! I particularly loved reasons 1, 3 and 5 (or S, J and T - you clever thing!). I love being enlivened to act straight away, having a project with a story and being able to create it in the most efficient way. I tend to buy myself a quilt book every Christmas (well, okay, perhaps not just at Christmas time), so I think I'll get this one. I LOVE those first two quilt photos!! I like learning about the inspiration for a quilt and also time saving techniques. Thank you! I am in Canada. These designs are fantastic. Id love some guidance on freeform, with easy steps I can follow. Im from Britain. I like having fresh points of view and since I am an American, I do not see a lot of Indian techniques. I like the fact that there are beginner quilt patterns. this book has some inspiring color combos! Love the sense of movement in her quilts & the simplicity with which Sujata does it. Very inspiring! Thanks for he chance to win a copy of this book. I like the idea of using plain fabrics in an innovative way. I have loved Sujata as a person on her blogs, through our shared web rings and message boards but even more through a few personal exchanges through the years. But one thing I knew I always loved was her quilting and her amazing way of infusing everything she design with her unique cultural style. Oh yes, I'd like to win a copy of her book. Can't wait to get my hands on one! I love the use of color in the book! I'm in Colorado, USA. Always on the lookout for new inspiration! Perfect colors and imperfection shapes. I am international. Sujata is amazing! I luv her free spiritedness! The various indigenous spontaneous piecework traditions from Asia and Africa. We think we invented it all, but not so. The book would be wonderful in my library. On the top of my stack of "to reads." I'd look forward to seeing the other uses of the blocks. I love that the book contains a variety for different skill levels! I'm always looking for a new approach and different blocks! Great book! Sounds like a book that would be great for a newbie like me. Thanks for the chance, Rachael. I'm a fellow Aussie. I love the colors in these quilt. I live in the U.S. I love how her quilts have a softness in the fact they are not exact. The curves and changes draw your eye all over. I really enjoyed your description and introduction to Sajata's new book. Looks fabulous, full of color and design...just what I love! Ahh...the wonderful use of color! I'm in the US; thanks for the chance to win! This book could help me on my improv journey. Thank you for the two chances to win one of Sujata's book. I think this book would be good to have because I loved your description of the personal stories and I love the colors of India. Oh, I am a U.S. resident. See comment above, sorry. I love Sujata's use of color and the movement of the pieces. I'm a US resident. I am always impressed at how her ideas make me want to Jump to it and try it or one like it! Thanks for the chance to win her book! What an amazing book, those quilts are gorgeous! Great review and so neat how you spelled out Sujata's name with the paragraphs. I love the way that my points don't have to match...they can be totally chopped off!!! I always seem to have headless geese, so this would totally work for me!!! I loved your 6 reasons to love this book! As a beginning quilter, it sounds like the perfect book to 'grow' with. I' m from the US and live in TX. THANKS FOR A CHANCE TO WIN! 'Jump to it' is the reason I would love to have a copy of this book! Such beautiful brilliant color and piecing freedom-I would love to win a copy of this book! I like the idea of new projects...like I need anymore! I always love a new book with a different outlook on quilting. Abundance of ideas. I like the idea that you can do so many different things with one pattern. I agree with you it does sound like there would be more than 15 projects here. I live in the USA. Thanks for the chance to win. I will checking your site out often. Great inspiration in books like these! I like bold and bright designs, new inspiration in both piecing and quilting. Accessable for all quilters. No quilt police. Easy techniques. Thanks for the extra entries. Your denim clam quilt is tops. So much creativity. I follow Sujata's blog and I find her work a complete breath of fresh air. I'd love to use and apply her techniques. Love the quilts in this book. Perfect for all those solids in the stash. I love the colors & uniqueness she displays. 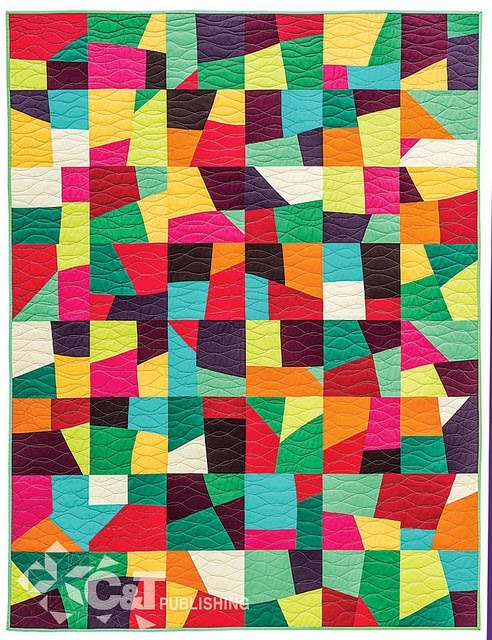 I'd love to try free-form quilting - and those bright colors and patterns are so appealing! I'm a US resident.